’A Critical Edition’ to me is an edition of a book that sets the work into its context, enabling the reader to better understand the work's genesis and sources, to get a grasp of how the book was received, and to assess its influence and importance then as well as now. At the same time, the word ‘critical’ in my opinion implies a re-evaluation of the work in terms of contemporary knowledge and understanding. In the case of a work of non-fiction this would include correcting errors. This is what I would – ideally - expect from such an edition, and – again: ideally – that is what I would expect of The Vampire His Kith and Kin – A Critical Edition recently published by The Apocryphile Press (paperback, $22.95). Edited by John Edgar Browning, author of Dracula in Visual Media, the book contains a facsimile of the first edition as well as texts by various scholars, including J. Gordon Melton, Rosemary Ellen Guiley and Carol A. Senf, and a number of appendices compiling information about Summers. Summers’s book itself is essentially as it is in the different printed editions I know of (Univ. Press, Senate and Dorset), except here all illustrations and the title page are faithfully reprinted. Appendix A contains translations of Latin and Greek quotes, although for some reason not all the passages in those languages are included. Appendices B and C contain some reviews, reactions, and various examples of correspondence between the author and other people, many of which are not directly related to the book itself. Appendix E is concerned with Summers’s sources, but only very briefly and only a small selection of sources is mentioned. 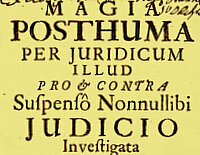 In many cases, just a frontispiece from a book is included, this is the case of e.g. Franz Hartmann’s Buried Alive (1895) and W. S. G. E.’s Curieuse und sehr wunderbare Relation, von denen sich neuer Dingen in Servien erzeigenden Blut-Saugern oder Vampyrs (1732) (I am not sure why this one is chosen as a source, and not some of the other books from the era that Summers mentions? Summers includes it in his bibliography, but this does not prove that he actually read it). Appendix F is a very short bibliography on ‘Vampires of Myth and Folklore’, which mixes important books, e.g. Paul Barber, with the useless, e.g. Basil Copper. Unfortunately, neither he nor the other contributors really address this ‘stigma’, and nothing what so ever is done to correct Summers’s (numerous) errors. So although the various authors hint at aspects worthy of a critical approach, it is actually just left with the hints. The reader himself is perhaps provided with some information that can allow for a critical reading, but he will have to find information elsewhere to do the work. Consequently, in my opinion this is not a critical edition, but rather an homage to Montague Summers and his work. Sadly, this means that the reader is left with no genuine understanding of The Vampire as part of Summers’s oeuvre. The relationship to Summers’s two original books on witchcraft is mentioned, but it is not developed in any way, although it is my understanding that the five volumes on witchcraft, vampires, and werewolves from Summers’s own point of view were part of a whole. Furthermore, very few insights into The Vampire’s role in the canon of vampire literature is provided. What was Summers's approach to the subject? How indebted was he to earlier authors like Calmet? How did he work on the book? What books were available to him at the British Library? How reliable is his research? How has The Vampire influenced later works on the subject? Most important of all, what were Summers’s most important contributions to the development of the term ‘vampire’? An analysis of his notions of the vampire as an ancient and universal phenomenon (‘The tradition is world wide and of dateless antiquity.’) and how they have influenced other authors and scholars would have been most pertinent and could have compared Summers's work with authors on the subject before and after him. I think there is a lot to say on behalf of Summers’s work, and at the same time one should be extremely cautious in reading him verbatim. For that reason, a genuinely critical edition is a really good idea. Unfortunately, this edition in my opinion is only one step towards such an edition, and I feel that what a reviewer wrote in 1919 in The Saturday Review about another of Summers’s books is worth quoting in this connection (the text is reprinted on pp. 382-3): ‘It is the fate of every great writer to be dogged by idolaters who persist in admiring his faults and follies; and it is difficult to say whether he suffers more from detraction than from foolish praise.’ The current edition lacks more material to follow that middle road between detraction and foolish praise that allows the reader to both appreciate Summers’s work and use it in the context of contemporary research. Hinting at the problems and errors inherent in The Vampire is not enough, a more detailed analysis is in my opinion required. So far I have not mentioned what is the best thing about the book, and the reason why anyone interested in Montague Summers as a person and author should get hold of this edition: A prologue by Gerard P. O’Sullivan, The Continuing Quest for Montague Summers, that provides a multitude of information on Summers and also sheds light on some of the mysteries surrounding Summers. This is a very interesting piece of biographical and literary detection, although it still does not conclusively solve the mystery of the ordination of Summers. I would have said that this was a pleasure to read, but the subject itself is not altogether pleasant, especially when it touches upon Summers’s sexuality, rumoured to involve ‘a partiality for small boys’ and the seduction of a choirboy at Bath in 1908 (p. xxxviii, xl). Obviously a lot can be said about Summers and his work, and there is good reason to be cautious when approaching it. For that reason, I am sure that today no one would publish a critical edition of his History of Witchcraft and Demonology without meticulously comparing it to the current scholarly understanding of the subject. Unfortunately, the field of vampire research apparently has yet to evolve to a state where the same is the case of his books on vampires. Thanks to Anthony Hogg for pointing me to this new book. Labels: Carol A. Senf, Gerard P. OSullivan, J. Gordon Melton, John Edgar Browning, Montague Summers, Rosemary Ellen Guiley, vampire books, W.S.G.E. I've yet to receive my copy, so I can't comment on its contents yet. But generally speaking, I would agree with your last statement. Thank you, Mr. Petersen, for your very thorough elucidation of the contents of this edition. Of course, the "argument" here--that is, the matter at hand--has less to do with the particular contents chosen for inclusion and more to do with how one arrives at the definition of a "critical edition," a subject which continues to spawn fairly lengthy debates among textual criticism scholars. The description you gave, while good, is but one of several approaches to producing a "critical edition," another being concerned primarily with cross-examining and cross-referencing all the major editions of a particular text (though this is generally typical of hand-written texts). The third and most prominent approach is the one we have chosen, similar in design to the quite popular "Norton Critical Editions" series--the major difference here being that we chose contextual documents which provided insight not only into the work itself but the author as well, since in this case the work in question, its writing, and the author himself are so closely intertwined, in our opinion. The contributors and I made every attempt to give no false impression of what was contained in this critical edition, particularly since the contents were clearly stated on the back cover and in the description given for the book at various websites; if you didn’t have access to this information, then I am very sorry. I, for one, am reluctant to purchase any book whose front and back cover I have not studied thoroughly. In short, we did not promise anything which we did not deliver--nothing more, nothing less. I appreciate your review. And, what is more, I encourage you to edit such an edition as the one you describe here. Fair comment, Mr. Browning (editor of the book), and thank you for showing an interest in my writings here :-) I would like to return to the subject shortly, when I have some more time to do so. See A Delayed Demonologist for more on Montague Summers.